401512 OTB 2-00-066 L.O. Separator Westfalia Model OTB 2-00-066 - Instruction manual & Spare Parts list. 104 pages. 401513 OTB 9-02-066 L.O. Separator Westfalia Model OTB 9-02-066 - Instruction manual & Spare Parts list. 158 pages. 401514 OTB 18-02-067 L.O. Separator Westfalia Model OTB 18-02-067 - Instruction manual & Spare Parts list. 138 pages. 401515 OSB 30-02-066 L.O. Separator Westfalia Model OSB 30-02-066 - Instruction manual & Spare Parts list. 126 pages. 401516 OSC 4-91-006 L.O. Separator Westfalia Model OSC 4-91-006 - Instruction manual & Spare Parts list. 164 pages. 401517 WSC 5-01-006 L.O. Separator Westfalia Model WSC 5-01-006 - Instruction manual & Spare Parts list. 176 pages. 401518 OSA 5-02-066 L.O. Separator Westfalia Model OSA 5-02-066 - Instruction manual & Spare Parts list. 148 pages. 401519 OSC 4-02-066 L.O. Separator Westfalia Model OSC 4-02-066 - Instruction manual & Spare Parts list. 144 pages. 401520 ON 1016, ON 2016 Separator Westfalia Models ON 1016, ON 2016 - Instruction manual & Spare Parts list. 88 pages. 401521 ON 3046 Separator Westfalia Models ON 3046 - Instruction manual & Spare Parts list. 176 pages. 401522 OSA 20-02-066 L.O. Separator Westfalia Model OSA 20-02-066 - Instruction manual & Spare Parts list. 128 pages. 401523 SAOG 3046 L.O. Separator Westfalia Model SAOG 3046 - Instruction manual & Spare Parts list. 106 pages. 401524 CC-1 Westfalia Centrifuge Monitoring Unit Model CC-1 - Instruction manuals with Equipment List and Circuit diagrams. 40 pages. 401525 D10 Westfalia Control Unit D10 - Instruction manual. 116 pages. 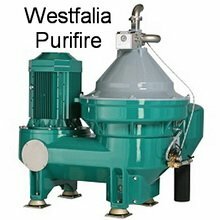 401526 OSB35-0136-066, OSB35-0136-566, OSB 35-01-066, OSB 35-01-566 Purifier Westfalia Type OSB35-0136-066, Type OSB35-0136-566, Type OSB 35-01-066, Type OSB 35-01-566 - Instruction manual & Spare Parts list. 116 pages. 401527 CB-1 Westfalia Centrifuge Monitoring Unit Model CB-1 - Instruction manuals with Equipment List and Circuit diagrams. 30 pages. 401528 OSB 35-96-066, OSB 35-96-566 Purifier Westfalia Type OSB 35-96-066, Type OSB 35-96-566 - Instruction manual & Spare Parts list. 144 pages. 401529 OSC 5-02-066 L.O. Separator Westfalia Model OSC 5-02-066 - Instruction manual & Spare Parts list. 144 pages. 401530 OTA 7-00-066, Type OTA 14-00-066 Purifier Westfalia Type OTA 7-00-066, Type OTA 14-00-066 - Instruction manual & Spare Parts list. 98 pages. 401531 VB 1 Westfalia Automatic Timing Unit Model VB 1 - Instruction manuals with Parts List. 74 pages. 401532 VESA-1.1 Westfalia Automatic Timing Unit Model VESA-1.1 - Instruction manual and Parts List. 74 pages. 401533 VESA-ES-2 - Westfalia Automatic Timing Unit Model VESA-ES-2 - Instruction manual and Parts List. 156 pages. 401534 VESB-ES-1 with PLC Westfalia Control Unit Model VESB-ES-1 with PLC electronic control unit for lub. oil centrifuges with self-cleaning bowl series OSA / OSB / OSC with UNITROL system - Instruction manual and Parts List. 134 pages. 401536 OSD 6-91-067 Separator Westfalia Model OSD 6-91-067 - Instruction manual with Spare Parts List. 206 pages. 401537 OSD35-0136-067 , OSD35-0196-067 Separator Westfalia Model OSD35-0136-067 , OSD35-0196-067 - Instruction manual with Spare Parts List. 226 pages. 401538 OSC 50-01-006 Separator Westfalia Model OSC 50-01-006 - Instruction manual with Spare Parts List. 226 pages. Westfalia UNITROL automation and control system operation.